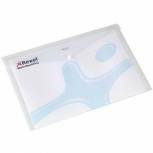 Rexel Budget Cut Flush Folder A4 Clear (Pack of 100) 12182 Pack of 1 Rexel Budget Folders. Cut flush lightweight folders. Open on two sides with cut out thumb hole for easy insertion and retrieval of papers. Manufactured from lightly embossed polypropylene reducing glare and copy safe. A4. Q-Connect Cut Flush Folder A4 Red (Pack of 100) KF01485 Pack of 1 Q-Connect Cut Flush Coloured Folders. 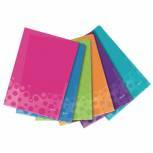 Durable A4 polypropylene coloured folders. Open top and side with easy access thumb cut out. Ideal for everyday filing requirements and colour coding documents and files. Colour - Red. 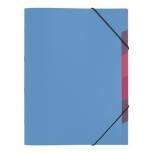 Q-Connect Cut Flush Folder A4 Blue (Pack of 100) KF01486 Pack of 1 Q-Connect Cut Flush Coloured Folders. 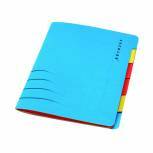 Durable A4 polypropylene coloured folders. Open top and side with easy access thumb cut out. Ideal for everyday filing requirements and colour coding documents and files. Colour - Blue. 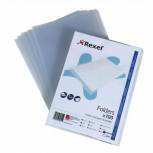 Rexel Superfine Cut Flush Folder A4 Clear (Pack of 100) 12175 Pack of 1 Rexel Superfine Folders. Cut flush, lightweight folders, open two sides with cut out thumb hole for easy insertion and retrieval of papers. Manufactured from crystal clear polypropylene ensuring clarity of contents and guaranteed copy safe. Size: A4. 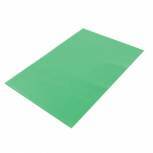 Q-Connect Cut FlushFolder A4 Green (Pack of 100) KF01488 Pack of 1 Q-Connect Cut Flush Coloured Folders. 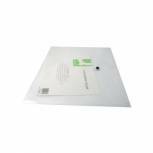 Durable A4 polypropylene coloured folders. Open top and side with easy access thumb cut out. Ideal for everyday filing requirements and colour coding documents and files. Colour - Green. 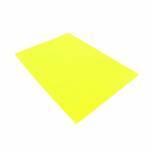 Q-Connect Cut Flush Folder A4 Yellow (Pack of 100) KF01487 Pack of 1 Q-Connect Cut Flush Coloured Folders. 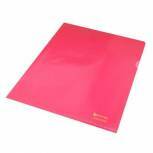 Durable A4 polypropylene coloured folders. Open top and side with easy access thumb cut out. Ideal for everyday filing requirements and colour coding documents and files. Colour - Yellow. Rexel Nyrex Cut Flush Folder A4 Assorted (Pack of 25) 12161AS Pack of 1 Top quality strong Nyrex material reduces glare finger marks and enhances contents. Open 2 sides with thumb hole. A4 assorted. 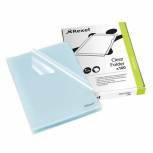 Rexel Popper Folder A4 Clear White (Pack of 5) 16129WH Pack of 1 Polypropylene folders for storing an carrying documents. Translucent folders for quick identification of contents. Popper closure to keep contents secure. A4 White. 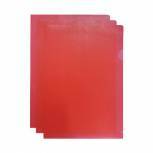 Red Cut Flush Folders (Pack of 100) WX01485 Pack of 1 Keep important documents clean. Help prevent creasing and curling at the corners. Thumb cut-out helps you access documents easily. Translucent finish allows you to view contents easily. Red in colour. Pack of 100. 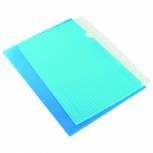 Q-Connect Polypropylene Document Folder A5 Clear (Pack of 12) KF02470 Pack of 12 Q-Connect Document Folders. Manufactured from hard wearing transparent polypropylene with a press-stud closing mechanism keeping contents secure. Size - A5. Colour - Clear. 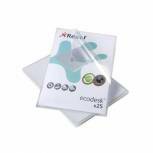 Rexel EcoDesk L Folders Top and Side Opening A4 (Pack of 25) 2102243 Pack of 1 Rexel Ecodesk L folder produced from 100% recycled post consumer waste. Flush cut embossed A4 folder made from hard wearing 160 micron 100% recycled polypropylene. 100% recyclable. 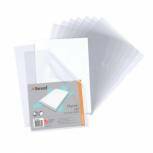 Rexel Nyrex Cut Flush Folder A4 Clear (Pack of 25) 12153 Pack of 1 Rexel Nyrex Cut Flush Folders. Premium quality folder with reinforced edges and thumbhole for easy insertion and removal of documents. Open top and side with a lightly embossed finish reducing glare and finger marks. Size A4. Colour - Clear. 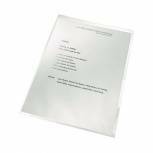 Q-Connect Polypropylene Document Folder A3 Clear (Pack of 12) KF02464 Pack of 12 Q-Connect Document Folders. Manufactured from hard wearing transparent polypropylene with a press-stud closing mechanism keeping contents secure. Size A3. Colour - Clear. 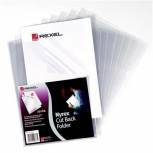 Rexel Nyrex Cut Back Folder A4 Clear (Pack of 25) GFA4 12121 Pack of 1 Rexel Nyrex Cut Back Folders. Premium quality folder with reinforced edges, cut back front and thumbhole for easy insertion and removal of documents. Open top and side with a lightly embossed finish, reducing glare and finger marks. Size A4. Clear. 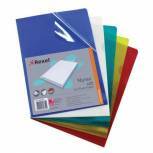 Rexel Cut Flush Folder Polypropylene A4 Clear (Pack of 100) 12215 Pack of 1 Rexel Folders ideal for everyday filing. Manufactured from polypropylene which prevents copy being lifted and the slightly embossed finish reduces glare. Open two sides with thumb hole for easy access to documents. A4. Clear. 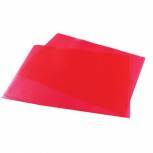 Rexel Nyrex Cut Flush Folder A4 Red (Pack of 25) 12161RD Pack of 1 Top quality strong Nyrex material reduces glare finger marks and enhances contents. Open 2 sides with thumb hole. A4 red. 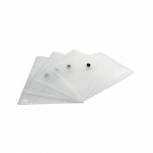 Leitz Recycle Cut Flush Folders A4 Clear (Pack of 100) 4001-00-03 Pack of 1 Leitz ReCycle Cut Flush Folders Clear Pack of 100 4001-00-03. Made from 100% recycled polypropylene foil. 100% recyclable. Copysafe. Embossed finish. 140 micron. 40 sheet capacity. 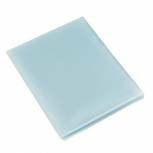 Jalema Secolor Sixtab 6- Part File A4 Blue (Pack of 5) 8331600-10791 Pack of 5 Jalema Secolor 6-Part File. Convenient A4 file with 6 dividers for daily use. Strong Kraftliner cardboard. Very bright colours. PEFC and Cradle2Cradle certified.